Upgrade Your Lifestyle With Pilates! We always want to upgrade our kitchen, upgrade our vehicles, our landscaping and wardrobe. But what could be more important than upgrading your health with the many benefits of the Pilates Lifestyle?! Joseph and his wife Clara arrived by boat from Europe in the mid 1920’s and opened their own studio in Manhattan. At that time, his practice was known as “Contrology”. Thus, control of muscles, breathing and movement. Gifted inventor and creator of what was perhaps the very first biomechanically correct exercise apparatuses; Joseph Pilates was a fitness “guru”. This was long before Cybex, Nautilus, or Bowflex contraptions. His greatest achievement was that he created devices in which movement and resistance were combined. Because springs were at the heart of it, they helped educate the muscles faster. We rarely think about the origins of the apparatus as we glide, slide, curl, flex, extend, pull and press. Usually it’s all we can do to keep our abdominals pulled in and up while maintaining our balance and breathing. These machines, each with their own efficiency, ingenuity and timelessness reveal Joseph’s legacy of keeping the world healthy. Joe’s quest for healthy living inspired him to develop chairs and beds that optimized both movement and rest. His early work was called “Pilates Automatic Balanced Health Furniture”. Although some pieces look like archaic torture devices, it’s extremely vital and relevant equipment that provides optimal fitness. Since so much of our work in a private or class setting involves posture, alignment, and breathing; it only stands to reason that this specific equipment facilitates each of these elements. What Would a Pilates Lifestyle Mean To You? Being aware of living in a body and enjoying the physicality of life. It means being aware of the responsibility you have toward your body. Instead of saying, “I have back trouble or knee trouble” and take medication or leave the responsibility to your doctor, take care of your body and do what you can to prevent these issues. Move, and you will feel better! This helps you with your mental and emotional balance. So let’s get out there and enjoy life! So many times we take our bodies for granted and then complain when something goes wrong. Be aware of what you’re eating, how you’re breathing, the movements you make and choose quality over quantity. Pilates is many things to many people. For some, it’s a career, a passion, a life path, a calling. For others, it’s given them the means and confidence to transform their bodies or their lives. And for plenty of others, it’s something they do once or twice a week at the gym because they like the teacher, or the class is at a convenient time. Regardless, you will always feel better for taking time for yourself. Joseph Pilates maintained that carefully executed sets of fewer repetitions are key to a balanced training program. He cited that whether you’re practicing Pilates or weight training, endless repetitions of unchallenging, reflexive routines make it easier for the mind to wander. To get the most out of your workout, you should apply the Six Principles of Pilates: Centering, Concentration, Control, Precision, Breathing, and Flowing Movement. We teach clients that Pilates is geared to all people. We’ll design a program that is going to suit someone whether they have chronic pain, or want to get in shape after having a baby, or want to improve their golf game. We cater to all individual needs. 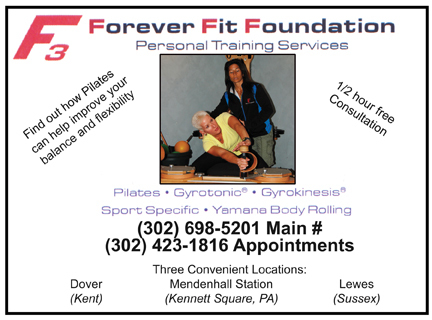 Visit our website at www.foreverfitfoundation.org for more information.